Heat oven to 375°F. Butter 2-quart baking dish or gratin dish. Layer sweet potato slices to fill dish. In 1-quart saucepan, melt butter over medium-low heat. Stir in flour, salt and pepper. Cook and stir until mixture is smooth and bubbly. Gradually add half-and-half, stirring constantly, until mixture boils and thickens. Stir in cheese and nutmeg. Remove from heat; pour cheese sauce over sweet potatoes. Cover; bake 40 minutes or until potatoes are just tender. Bake uncovered 30 to 35 minutes longer or until golden. Let stand 15 minutes before serving. 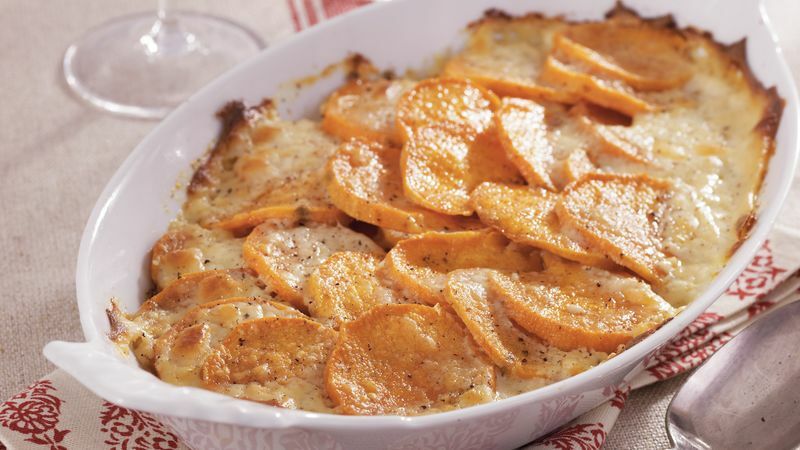 This gratin is a less sweet alternative to the classic holiday sweet potato casserole. Freshly grated Parmesan can be substituted for the Gruyère.